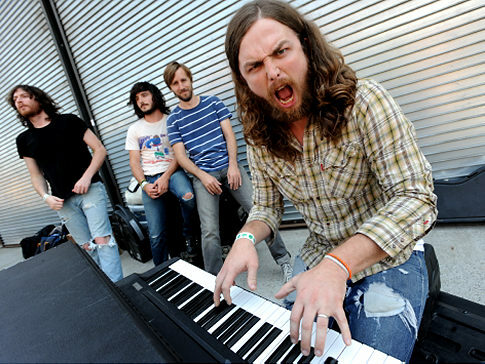 If you haven’t heard of J-Roddy Walston and the Business yet, get ready. Originally from Cleveland, Tennessee (home of the Church of God), Walston was raised on Gospel and Country, genres that can still be heard in his music today. It was there that he learned to play the piano by watching his grandmother, who, he admits, didn’t remotely understand it when he married those skills with an extremely energetic and soulful Southern Rock sound. In 2005, Walston moved to Balitmore, where he picked up his bandmates – drummer Steve Colmus, guitarist Billy Gordon, 31, and bassist Logan Davis. The band released a self-titled album in 2010, which includes my favorite tune (see below) “Don’t Break the Needle”. They’ve recently signed to ATO Records, announced a massive tour (see below for dates) and are working on a new album. Expect to see a lot more from these guys, and go see them live – you won’t regret it.